you look beautiful in each and everyone of them,, I love that shade of green too, you are a true beauty! Those are delightful dresses and skirts! I'll have to go have a look at Modcloth! We've purchased from eshakti for many dresses. We love the quality, but did have issues with special orders. The fit was too big in the waist even when we sent exact measurements. Overall they are a great company for clothing! I don't wear dresses often, but when I do I buy from the two places you've mentioned, very satisfied with both. Thanks for gorgeous photos and introduction to these sites, Stephanie. Looking forward to leisurely browsing them this evening. What a fun addiction to have, dear Stephanie!! I too love fabric but for other reasons!! You look so delightful in all that great photography!! What ya goin' get this year? You always look so lovely and festive and do a great job coordinating. Your dad always enjoyed his girls all dressed up, just so you know. You should have been a model, Stephanie dear... you would look adorable wearing a flour sack but these dress are ALL stunning. I don't wear dresses a lot any more but I do agree it is fun getting all dressed up. It's usually long tunics and pants, sometimes legging and boots (if the tunic is long enough) for me. If I looked as cute in those dresses as you do, I'd be tearing that store up, girl! Thanks for the fashion show but now you better go inside and get out of the cold! LOL! Love & hugs! Loved all the dresses and you looked so pretty in each one!! I am going to check the site out as no dresses to be found at any stores here. Beautiful dresses and beautiful model :-) I will definitely be looking through these websites. Thank you for sharing them. Are you all ready for Christmas? Hard to believe how quickly it is approaching this year. Have a wonderful afternoon. My girls introduced me to Modcloth - agreed! They have the most beautiful dresses and I love all of the vintage-look options. Unfortunately I do not have your tiny waist so most of these styles look hideous on ME. YOU however look adorable!! The tulle dress and the pinecone dress are my favorites but they are all beautiful. I always had a Christmas dress growing up and made sure all of our kids had new outfits for Christmas. Our church is pretty casual and I teach SS so I typically don't dress up a lot, even for Sunday. I did however buy a beautiful embroidered dress/tunic that I plan to wear with a pair of leggings and a flat. Just one flat lol. I broke my ankle last week so there will be no cute heels for me this year haha! Maybe I'll embellish my "boot" with yo-yo's in a Christmas fabric hahaha! People will think I lost my mind! How nice that you found a place that has dresses and skirts that are so YOU! They are all pretty and perfect on you. I don't buy dresses or an outfit for Christmas because I have brunch at my house and I wouldn't want to cook in a new pretty dress. Now, if we were going out, I definitely would want something new. Girl, You could have been a model! Those dresses and skirts are beautiful on you. I have heard of eShakti and visited their website before but wasn't sure how reliable their clothing is. I'm happy to hear it recommended from you. I will check out ModCLoth and see what they have. I've not bought a new dress in years. Love & hugs!!! Hello Stephanie, oh you look so pretty in each of your dresses. Thanks for the idea of looking at these websites. I will have to start thinking of what I am going to wear to a couple of holiday parties. Oh Stephanie... each dress is so pretty and festive and you model them so well! 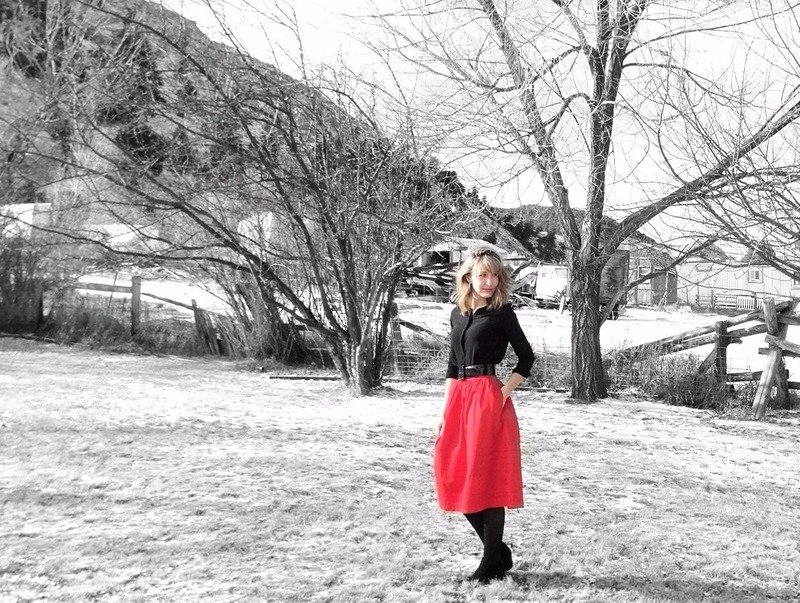 Love the snow as a backdrop! I haven't worn a dress for years and years. I think the last time was in the mid-90's when I was country western dancing, and I would wear fitted knit dresses with swirly skirts that would flare when I danced! and of course always wore boots. I'll never forget one Christmas around 1994 or 95 that I bought a RED knit fitted dressed that was above my knees! I wore it dancing with boots that had some gold trim.. I felt like the belle of the ball. I have hardly ever really bought anything new for Christmas, except an occasional turtle neck top with some sort of Christmas designs.. never bought an "ugly sweater", except in the 80's.. oh so many years ago, I had the most gorgeous red sweater that had sequins along the neckline.. and I would wear it "out" or to work during December with my black leather skirt, black nylons and my heels. Of course, then, I was nice and slender! Nowadays... that is not the case so I don't wear dresses anymore as a thick waistline and no shape, so I think a dress on my sort of figure is not becoming at all. I too resort to leggings and long tunics or sweaters and little scrunchy boots. I DID however, buy this year some Christmas leggings.. red with white snowflakes which I love! You look fabulous in your Christmas dresses! I don't usually wear dresses during this time of year, as my poor legs can't endure the frigid temperatures and I've yet to find tights that can keep me warm during the winter. I've browsed Modcloth before, but the high shipping costs have always prohibited me from ordering. Now I'm off to ogle the pretty dresses! I love them all...but esp the one from 6 yrs ago...Beautiful. Beautiful outfits Stephanie - I enjoyed your fashion show. Oh my Stephanie, as I've said before, you could be a model...well, you are a model for all of us in your beautiful inside and outside!! The dress, each and every one look absolutely stunning on you. I especially love the lace and that feminine tulle one (princess quality). The pine cone one is so cute, and the roses one...oh my! 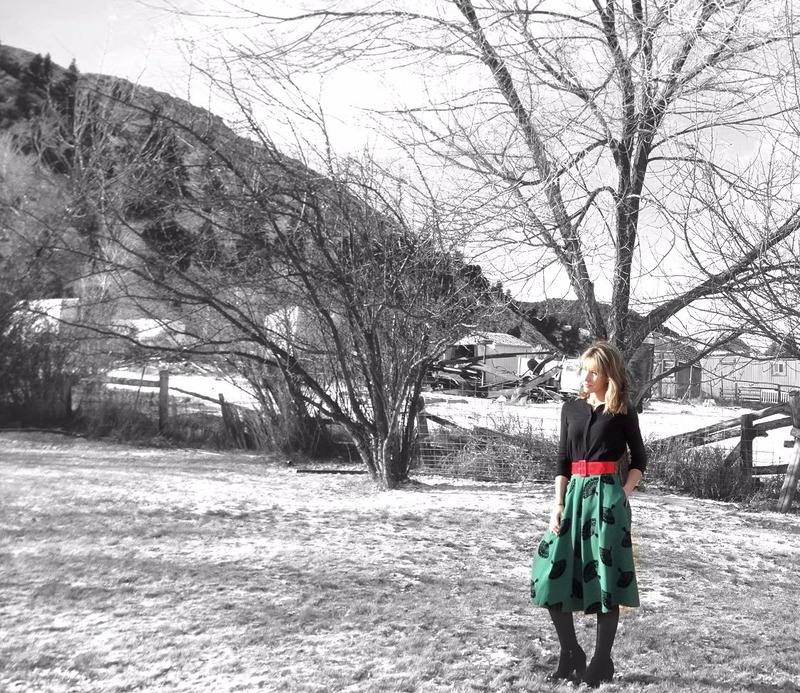 The skirt is so versatile, for many seasons. I will need to check out the sites that you mentioned. You are such a doll!! They suit you perfectly ! Beautiful dresses, Stephanie. I'm even more impressed to see you modeling them out in the snow without a jacket. But then, that would defeat the purpose wouldn't it! I regret to say that some of the dresses you are wearing are low-cut and one is too short. In other words some are not modest. The two clothing companies you mentioned obviously sell some immodest clothing (I have looked at their websites.) It is not good enough that some of their clothing is modest. ALL their clothing ought to be and I would not support either company with my money. By the way, I live in Northern Ireland and am a 58 year old wife and mother. We have a 19 year old daughter. My dear Susan-Anne, I truly appreciate the time you took to leave a comment and many thanks for your feedback. You mentioned that some of the dresses I am wearing are low-cut, but what you can't see in the photos is that I have a tank top or camisole underneath which solves the issue of being low-cut. As for the length, I know everyone has different standards. For me, I keep my lengths knee-length or longer and this is simply my taste and conviction. I truly desire to be modest and I seek to honor the Lord in how I dress. Because of this desire I pray over what I wear and I allow the Lord to lead and convict. After all, He is the highest authority. Again, thank you for leaving a comment. Have a blessed Christmas season. You are truly an honor to the Lord. Oh Stephanie, what pretty feminine dresses to see instead of everyone in jeans nowadays. I love the first one with roses and the beautiful green dress. perfect. Such pretty dresses! I'm not a dress girl, other than in the summertime when it's hot. The rest of the year I pretty much live in jeans. Having legs that exceed the normal length means getting something long enough is not easy - add that to the fact that I only like long dresses and it makes it even more fun. Oh yes - AND it's cold here!!! So beautiful dresses!! you are looking lovely..
Stephanie, you are beautiful inside and out and those dresses are perfect on you! I've not heard of that company before but now I must go there and dream! And, my dear, you wear them all so well and they look just like you. I got my christmas dress for this year at Talbot's. It's a solid red sweater like fabric with a 3/4 bell sleeve. Very sleek and classic. I love it. I'm off to check out Mod Cloth. Blessings abundant! Girl, you could be a model! Those are beautiful dresses. Unfortunately, I'm a big gal, and I tend to look like I'm wearing a potato sack. I have lost a bit of weight with chemo. I'm hoping to lose some more. My Beautiful Friend, You look stunning in each and every gorgeous dress you share here. Each one is so pretty and the fabrics are beautiful. I love the lace and of course the rose dress is spectacular. The tulle skirt is so romantic and lovely. You look like a model in each one and I love your fashion style. Thank you for sharing the source to your dresses and the links. I will have to check them out. So enjoyed this lovely post and your beautiful photos mixing the black and white with color. your dresses are really beautiful and they fit so well. i don't wear dresses, our family is very casual!! What a fun photo shoot! I love all your gorgeous vintage dresses and I too cook look for hours at ModCloth. At the moment I am staying away from places I can't afford otherwise I might be tempted. But your lace dresses are so divine and you are stunning! Thank you for sharing. Your style and modestly beautiful fashion is always on point and just absolutely lovely! Ohh, these dresses!! I can see why you love and chose each and every piece you found. I don't think I can pick a favorite because each and every look is so feminine and elegant. And you, dear friend, look so very stunning and lovely. I was hoping to sew a new blouse or dress for the season in a velvet fabric I picked up recently, but have yet to get to it. Hopefully soon :) Until then, you have definitely given me ideas for styling some of my pieces for this glorious season. Thank you for your oh so sweet friendship & every comment you have left that always makes my day brighter more than I can express :) In case I do not have a chance to be on the computer or blogger as often as I'd like to be before the holidays, I wanted to wish you now a most blessed and joyous season & Christmas with your son, husband, mom, and loved ones♥♥♥ And I hope you will get a white Christmas in the mountains! Love and hugs to you always! Oh my dear Stephanie! What fun to get a new Christmas dress every year. In our family, we always got a new Easter dress. Every spring my mom would either sew us new dresses or once we got older, we could shop with her to pick them out. 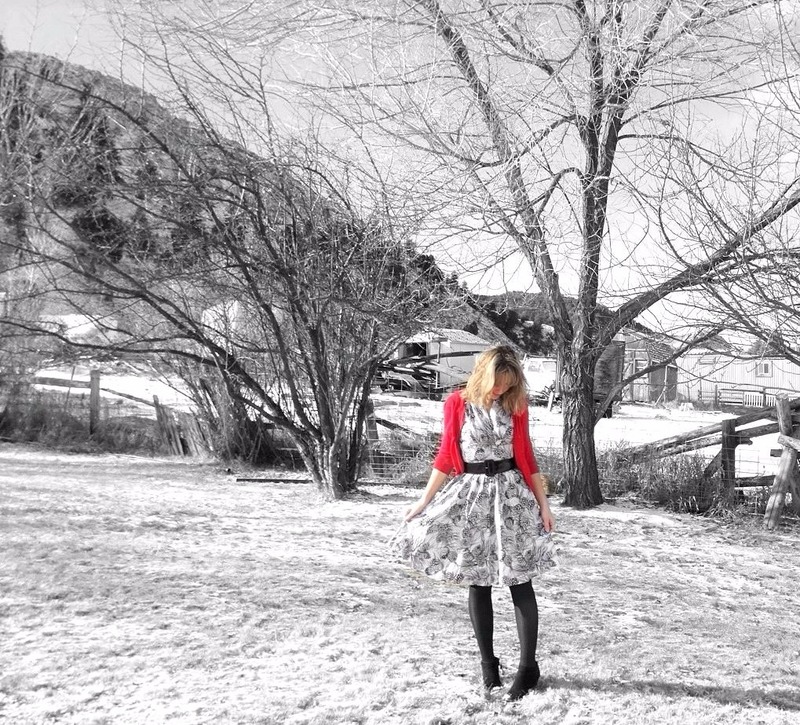 I think having a new Christmas dress each year is a great tradition! I enjoyed seeing all the beautiful dresses that you have bought from Modcloth through the years. You certainly are a beautiful model! I just loved all the styles you chose, and I especially like the cardigans worn over the dress too. As I read through the comments, I noticed the comment from Sarah, and I just wanted to tell you that you answered her views very lovingly and in a beautiful way. We can't please everyone who comes to visit us, and I just wanted you to know that your answer was kind, gentle and true. You are a true gem of a Christian my dear friend! I hope you have a blessed and wonderful Sunday, as we get ready for the final week of preparations for Christmas :) Hugs to you today dear friend!